BANGI, 26 Mar. 2012 -UKM undergraduate students have come up with an energy saving system that can save commercial buildings up 30 percent of their normal energy consumption. 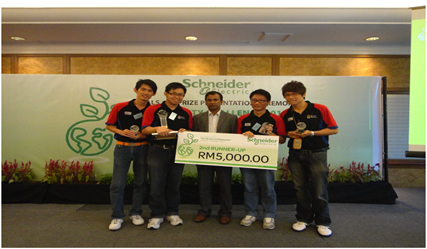 Four students from the Faculty of Engineering and Built Environment (FKAB) Yap Wei Yee, Teh Chin San, Ng Lock Khai and Kang Cheng Wei with the guidance of their lecturer, Associate Professor Dr Mohammad A Hannan developed the system which was awarded third place in the third Schneider Electric’s University Challenge 2011 “Go Green Malaysia” last month. The challenge is a competition designed to inspire engineering students at public and private universities in Malaysia to develop creative and innovative solutions for efficient energy usage. They received RM5000 in prize money and a trophy for the system which they called Naturalistic. Schneider Electric is a global specialist in energy management, with solutions for power and control, critical power, energy efficiency and automation. Installation of the system in an office building ensures maximum efficiency in the use of energy in the building. “We proved that the system reduced power consumption, carbon footprint and Building Energy Index up to 30%. We believe Malaysia can go green through achieving more by using less”, said Asso Prof Mahammad. There is still a lot of buildings that is being built without consideration to energy consumption. By right energy can be reduced by making sure that it is only used when needed. The system incorporates the usage of a series of sensors to measure and control humidity, light intensity and temperatures. It also uses a motion detector which will detect a person walking into a corridor and automatically turns on the light. The light will also be turned on in varying intensity based on lights available in its surroundings. The system thus helps to reduce the use of energy in any building fitted with it. The sensors will control office lighting, exhaust fans, ceiling fans, building area with localised dimming depending on the surrounding. It also harnesses the morning air to cool the building. The system was built by adapting the concept of energy management by Schneider Electric.